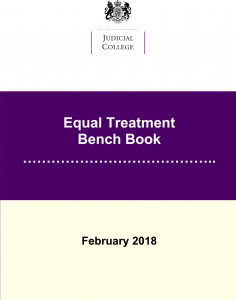 The Equal Treatment Bench Book has been updated, expanded and improved. It aims to increase awareness and understanding of the different circumstances of people appearing in courts and tribunals. It helps enable effective communication and suggests steps which should increase participation by all parties. This latest edition of the Equal Treatment Bench Book cites recent evidence regarding the experiences of different communities living in Britain today. It is full of practical guidance aimed at helping make the court experience more accessible for parties and witnesses who might be uncertain, fearful or feel unable to participate. It includes new and expanded sections on litigants in person, refugees, modern slavery, Islamophobia and anti-Semitism. There are practical tips on communicating with those speaking English as a second language or through interpreters, communicating with people with mental disabilities, a guide to different naming systems, and latest views on acceptable terminology.